Owned by the German government, the Deutsche Gesellschaft für Internationale Zusammenarbeit (GIZ) GmbH provides services in the field of international cooperation for sustainable development. GIZ works on behalf of public and private sector clients both in Germany and overseas. These include the governments of other countries, European Union Institutions, the United Nations, World Bank and other donor organizations. GIZ operates in more than 120 countries. We have approximately 20,000 staff around the globe, some 70% of whom are national. 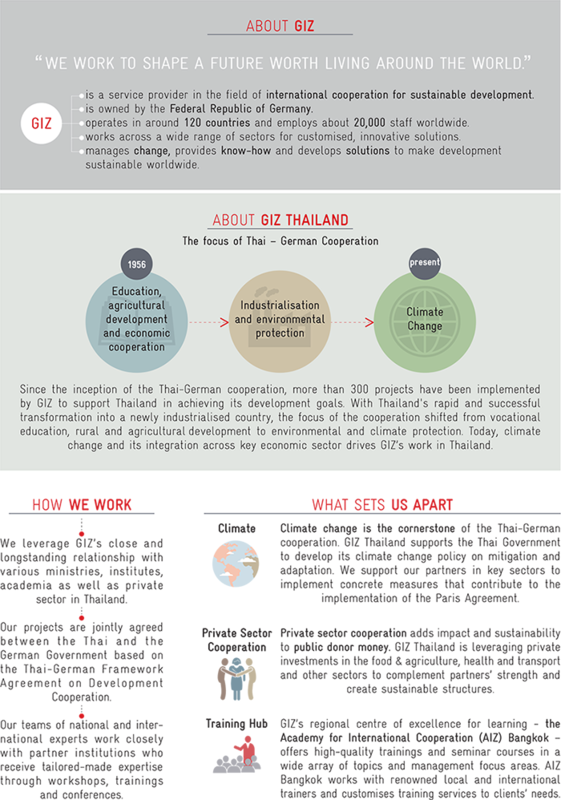 GIZ Thailand Portfolio in digital file can be downloaded here.